The April 21 Trail Cleanup Day has been cancelled. The access roads are still closed to traffic making access extremely difficult to do the job we need to do. We hope to gather some willing hands to go out on Wednesday, April 25 if the conditions warrant. If you would be available for either Wednesday or Thursday, please click on the big yellow button. Shortly after the chapter obtained the DR field and brush mower, Cal stepped forward to adopt the section of trail from Firth Lake to Hwy CC, and mowed it frequently for many years. It is a difficult section of trail to mow, and takes multiple days to do it. It includes an extensive stretch through shoulder-high hayland along the edge of open farmland. Often Donna joined him for moral support and to clear the branches that would hinder the mowing. Not limiting themselves to just mowing, Cal and Donna took on other tasks on their section, including minor adjustments to the trail route when required. On one occasion they hauled in posts and marked a section of trail where logging had left it unnavigable. After health concerns dictated that he turn in his mower keys, Cal continued to volunteer in other ways until one day he announced that he was ready to resume mowing, which he did for another two years. In later years, Cal would always come to the Parade of Colors to offer his services driving hikers to their starting points, while Donna would offer refreshments. When they couldn’t help at a recent MSC project, they turned out to check things out and bring a load of cookies. 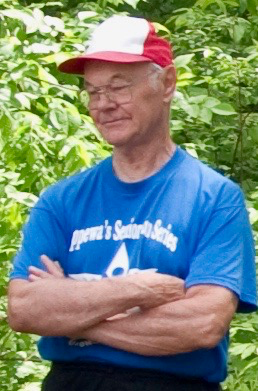 We all miss Cal Kraemer, and appreciate all that he has contributed to the trail, the chapter, and as a friend. Thanks, Cal. Blue Hills Trail Improvement Day, Thursday, May 3 Also Cancelled! Unfortunately, the May 3 Blue Hills Regional Trail Improvement Day has also been cancelled. We assume the snow may be gone, but it will be too wet and muddy to accomplish our goals for that day. We are currently working on an alternate date. A small trailbuilding event has been announced for June 6-9 with a focus on replacing the Mudbrook bridge and boardwalk. In addition to the structures, an unknown amount of new tread may also need to be constructed. This is an IATA Mobile Skills Crew project, and will include the usual MSC features: food and campsites are provided at no cost, learn as you work under the eyes of experienced MSC leaders, lots of camaraderie and entertainment capping off a day of hard work. The event is identified as the Harwood Lakes Segment project, and registration is now open. The catch is that due to the circumstances caused by much of the activity being on a boardwalk and bridge, the registration is capped at 40 participants. Registration is open, but there are only a few slots left and we hate to leave you out. If you are still hoping to come, you should register now. Camping and meals will be at the Chippewa Moraine - Old Girl Scout Camp site that was used for the Wayward Beaver project in 2004. Did you vote yet today? Remember to vote for your favorite trail and help IATA win! It’s the Gear Junkie’s “Fastest Known Time” contest. One of nine “Iconic Trails” will win $5000, and all will win something. You can win something, too (a guided hike, a pair of trail shoes). Vote early and often — daily if you wish — and even get bonus votes each time you upload a photo taken on the trail. Vote often between now and May 31. The IAT is doing quite well right now with double the votes of its closest competitor, the Superior Hiking Trail. One suspects they are planning a stealth attack when our guard is down, so don’t be lulled into complacency! Set your reminders app to remind you to vote every day. (Note: The new days starts at 7 PM).